A doily is according to webster a usually round cloth or paper that has a decorative pattern made of many small holes. 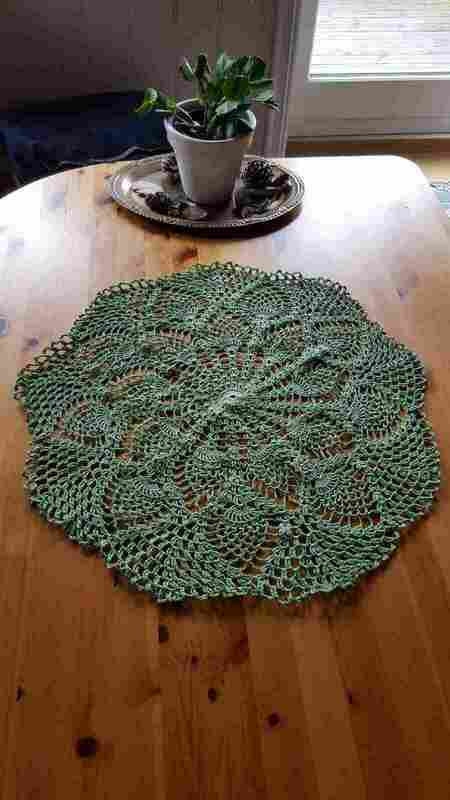 Other places said it was usually made in paper, linen or lace and used as a small napkin or decorative mat, but I have seen it used for larger table cloths too in the lacy style of crochet. The word doily seems to come from an 18th century London draper. 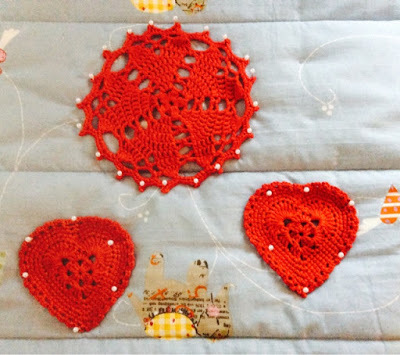 So I might not have made a doily in the original sense of the word, but I have used doily patterns and crochet in a thicker yarn and I do own a few doilies most purchased at flea markets. When I think of doilies they are lacy, round, white and crocheted, like this example, but in my head bigger than a napkin which seems to be the original use of a doily, I think now doilies are used more as table clots. A doily I crocheted in a bit thicker yarn which I gave to my mother for Valentines with two heart coasters. 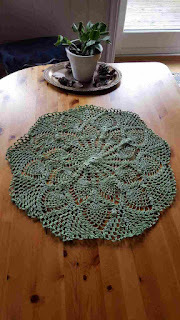 My mother makes amazing doilies and table cloths using thin crochet thread and mostly a pineapple pattern. They are thin and lazy and in all the colours she can find in thin thread, and she usually finishes them quite fast too. I wish I had a round table so she could make me a few! 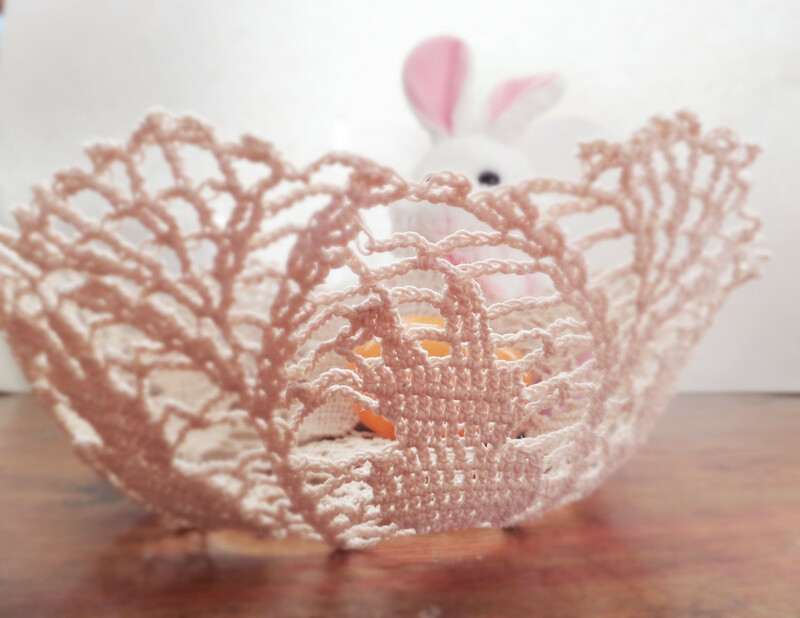 Here is a doily pattern I want to make, this one is stiffened to make it into a bowl but I would rather have a doily I think, or perhaps both. I framed the doily I knit in an embroidery hoop and hung it up on the wall. It's orange and matches my bedroom decor. 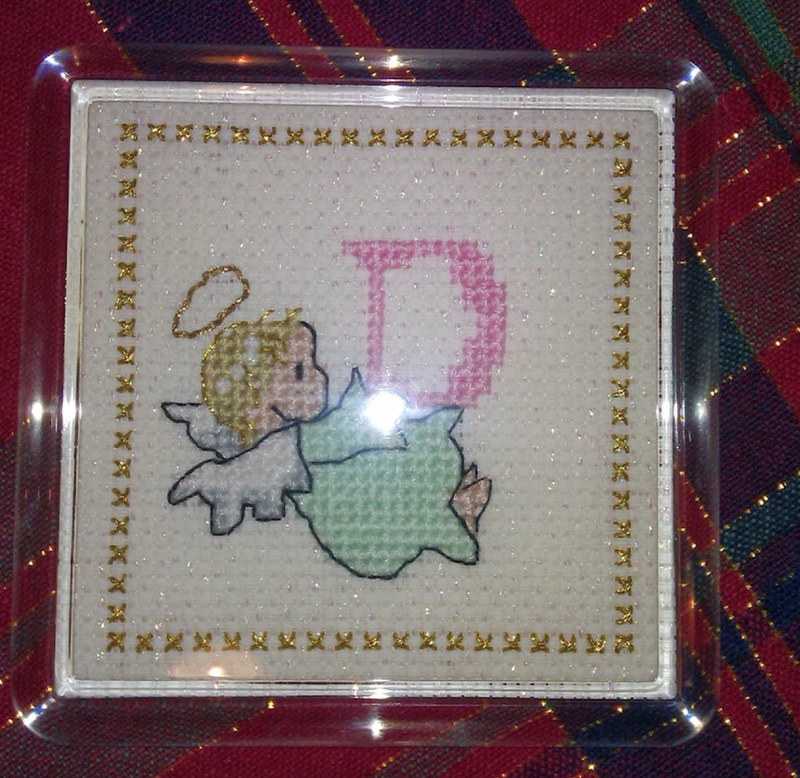 I also bought some doilies from a thrift store because I was hoping to use them in a crafty way, but so far haven't found a use I like. Framing things in hoops always look great, I should do that more.